Submitted by Paul McConnell on Tue, 31 Mar 2015 - 16:33. When the Bishop gave his consent to enclose Ealing Dean Common and turn it into allotments, he said the tenants were to be appointed by “a Committee of Management, of whom the Vicar for the time being, always to be one”. The first management committee was appointed by the parish vestry at its meeting on 6th February 1833. It included the vicar, the Rev Sir Herbert Oakeley, the two churchwardens, the two overseers, the assistant overseer and fourteen gentlemen of the parish, including George Wood, the largest landowner in Ealing at that time. One of the churchwardens was Thomas Meacock, the senior member of a large family of farmers who farmed most of the fields immediately around the common. The quorum was set at five. The London Metropolitan Archive (LMA) holds records for Ealing parish, including documents relating to Ealing Dean Allotments. Amongst these are seven loose pages of committee minutes from 1835 and 1836, then a twelve year gap before a minute book containing the minutes of 60 meetings between 1848 and 1860 and finally a further two loose leaf minutes from meetings in 1862 and 1863. 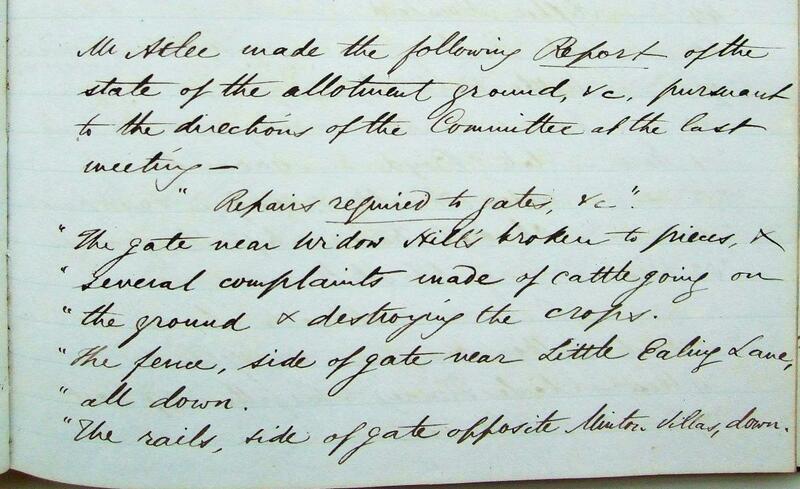 It is known that the first committee meeting was held in February 1833 but the earliest minutes at the LMA are for 9th July 1835 (see extract shown to the right, courtesy of London Metropolitan Archive, City of London). Because of the lack of minutes from the earliest meetings, we know nothing about how the committee invited people to become tenants or what work was undertaken to prepare the common and lay out the plots. We know that the first tenancy agreements were signed on 22 March 1833 and that certainly by 1854 there were 145 plots, each of 20 poles, twice the size of a full-size plot today. These were located in three sections: 49 on the East side (the current allotment site); 83 on the West (the section developed as housing in the 1980s west of Northfield Avenue); and 13 on the North (presumably approximating to Dean Gardens). Annual rents were set at five shillings per plot (25 pence today) to be paid in four instalments on quarter days. This remained the rent for at least 30 years with no increases during this time. Collecting the rent was a different matter and soon became a concern. Mr James Hemmings, overseer and committee member, initially undertook the task and his counter-signature appears on many of the earliest tenancy agreements. As a gentleman, he presumably did this on a voluntary basis, but by 9th July 1835, he announced he was giving up. He proposed that collection of the rents be put in the hands of the master of the workhouse, Mr Gore, putting the onus on the tenants to attend the workhouse to pay their rent. 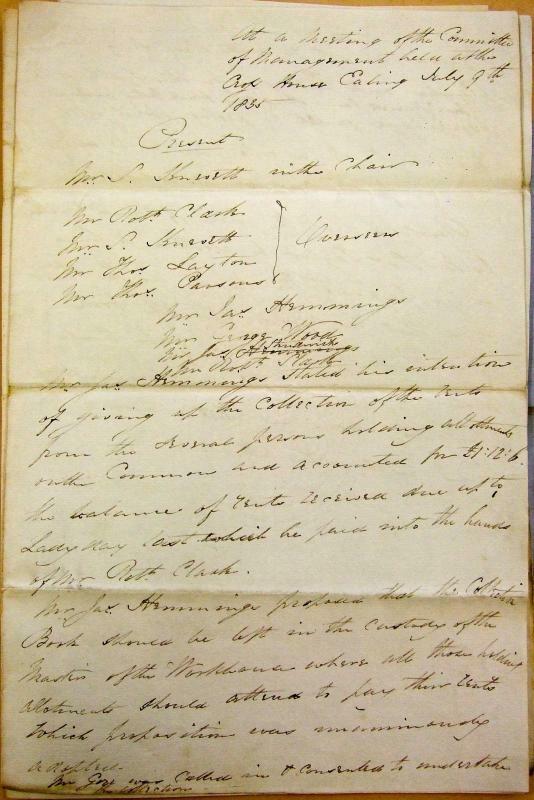 This became the practice for just over a year, but by November 1836 the committee appointed Joseph Dickinson as rent collector on a salary of £3 per annum. However, by 1st February 1838, rent arrears had risen to £23 : 18 : 9d, a very large proportion of the £35 total annual rent due. The committee gave Mr Dickinson notice that they would dispense with his services next Lady Day. Because of the absence of minutes it is not clear what arrangements were then made. By October 1848, when the minute book takes up the story, it is clear that there is a General Committee, meeting 17 times up to 1860 and a Sub Committee of Management, meeting 43 times. They also had a treasurer, Mr Robert Stark. The sub committee dealt with rent arrears and neglect, warning tenants and serving notices to quit (NTQs) reletting vacant plots and so on. The General Committee mainly seems to deal with the treasurer’s financial reports and major disciplinary matters and disputes. Possibly the treasurer himself collected rents during this period, but on 11th July 1853, the sub committee appointed Mr Atlee as rent collector and he was immediately asked to write a report on the general state of the allotments and the position on rent arrears. This was Richard W Atlee who lived at Church Square (near St Mary’s church) and was Parish Clerk at the time of the 1851 census and described as Parish Tax Collector in the 1861 census. Learning from the previous experience of employing a collector, they paid Mr Atlee on commission at 10% of the rent collected. At the next meeting on 23rd September 1853, Mr Atlee painted a picture of some neglect, reporting as follows: “The gate near the Widow Hill’s broken to pieces and several complaints made of cattle going on the ground and destroying crops. The fence, side of gate near Little Ealing Lane (presumably Northfield Avenue) all down. The rails, side of gate near Minton Villas down (this was across Mattock Lane on corner with Northfield Avenue, now the Dominion housing association development). The gate opposite Green Man all taken down (the former pub on the opposite side of Uxbridge Road). All the ditches on the outside of the allotments want cleaning out very badly”. He went on to say that 15 plots were vacant and seven tenants wanted to move plots. (See extract to the left, courtesy of LMA, City of London). The committee decided that when all the good plots were taken, the “gravelly pieces” should be given to new applicants, rent-free, until a better plot became available. They also set about inspecting the ditches and paying to have them cleared. By Lady Day (25th March) 1854, rent arrears stood at £12 : 15s - almost half the level of 1838. In June 1854 it was reported that £11 had been spent on repairing fences along Uxbridge Road and £5 : 13s on cleaning out ditches. All the plots were let, including three let free of charge and two at half rent (being bad plots for cultivation) and there was a waiting list of 20 applicants. By November 1856 arrears had fallen to £5 : 8s and the allotments were generally in a satisfactory condition. The committee unanimously agreed the report was highly satisfactory. It seems that at last the committee had found in Mr Atlee a competent professional who had turned round the management of the allotments. He remained in the position at least until 1865.